Whenever user clicks on a link to browse to another web page, using Back or Forward buttons, or type a URL in IE (any version Internet Explorer such as IE6, IE7 and IE8) web browser, a “click” clicking sound is played. The clicking sound of IE is actually triggered by “Start Navigation” event of system sounds for Windows Explorer, which IE tightly integrates with. When you navigate to a web page, it’s obviously that you are starting a navigation. Most web browser silently load and display the web page without making noise. If you felt annoyed with the clicking navigation sound in IE, here’s how to disable and turn off the clicking navigation sound in IE. 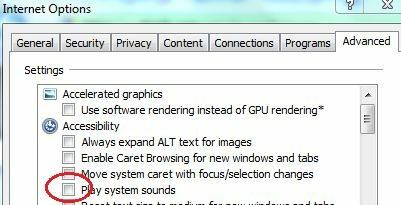 Go to Start Menu -> Control Panel -> Hardware and Sound -> Sound (or Sounds and Audio Devices. In the “Program Events” list, navigate to Windows Explorer section, and select Start Navigation. In the Sounds drop down box below, select (None) to completely turn off the sound. Alternatively, you can select other sound (click Browse to select any .wav audio file) to play whenever Windows Explorer and IE start navigation (to another page). If you have enabled navigation clicking sound in IE9, above trick will work too, but will affect both Windows Explorer and IE9. 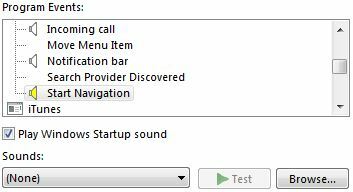 It’s possible to turn off start navigation “click” sound from playing in IE web browser only with the trick below. 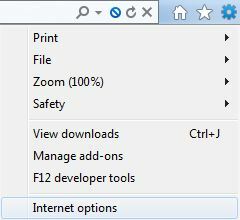 Click on Gear icon (or Tools in menu bar), and select Internet options. Under Accessibility section, unselect and untick the checkbox for Play system sounds.